CRAFTDOC » It’s Sale-A-Bration Time! Here are some cards made with the free stamp sets. By count in the gallery on SCS, the So Many Scallops set is the top running favorite! See the SAB minicatalog with the link to the right under Specials. To me, the most exciting news is that new demonstrators get both a Free stamp set from the big catalog AND a 20% discount on the kit (now $159). In my 10 years as a demonstrator, I have never seen both a free set and a discounted kit for new demos! And, you can now order your kit on-line! Just click on my demonstrator website link at the right and enter KIMWILSON for the password. You can contact me (link to right) if you have any questions. My group is called Stampers to Remember, because we love to stamp and scrapbook. 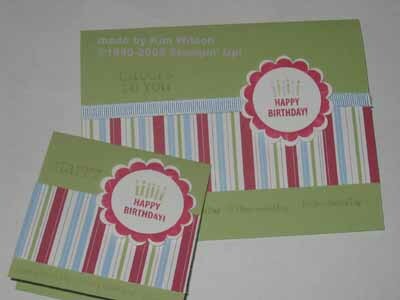 These cards use both the So Many Scallops and Lots of Thoughts SAB sets. A bit of Cutie Pie dp and bashful blue ribbon top them off. I used markers to get the different colors on the scallop stamp.